December 12, 2018 Fernando Herbert, B.A. Learning a new language is all about making it part of your life and spending a little bit of time every day concentrating on picking up something new about the language you are learning and slowly building up your fluency. Music is an easy way to build English into your daily routine. It’s a low effort, low impact way to pick up pronunciation and colloquial phrases or expressions and is as simple as putting in your headphones. Listening to music in English means to can be studying whenever you are on the move and while you are completing other tasks, such as cooking or cleaning. What Are The Benefits Of Learning English Through Music? 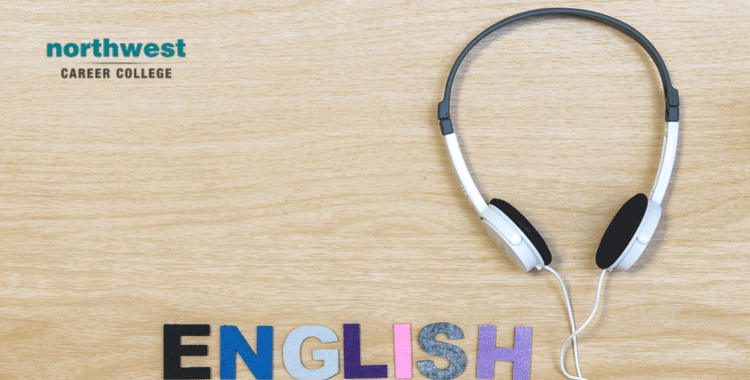 There is a range of scientific evidence that suggests that music is an effective way for English as a Second Language (ESL) learners to improve their grammar, vocabulary, and pronunciation. Added to that is the Mozart Effect, the theory that suggests rhythmic music can help to boost metal performance, helping students pick up new languages faster. Because they are aimed at native English speakers, song lyrics are full of slang words, colloquialisms, and modern English expressions. Listening to song lyrics is an excellent way to pick up language that often isn’t taught in class. Learning a language is as much about learning its flow and rhythms as it is about learning its vocabulary and grammar. Unsurprisingly, learning through music helps you master how English is spoken, not just what words are used. Using English as part of your language learning routine can help to improve your knowledge of the language’s rhythm, tone, and beat. Lyrical repetition is a key part of many types of music and is most common in rap, R&B, and pop music. Listening to songs with a repetitive pattern is an excellent way to commit new vocabulary to memory. Music has a way of getting stuck in our heads and is more persistent than simply learning new words by rote. When trying to learn new vocabulary, find a song that you like that contains those words and let it get stuck in your head. Listening to English Language music is an excellent way to absorb the culture of English-speaking peoples. It can be an insight into the way English-speaking people think and feel. If nothing else, having a knowledge of popular songs and artists gives you something to talk about with your English-speaking friends, and a good conversation is a great way to improve your English. How Do I Learn English Through Music? Don’t pick a song that is too fast paced, uses a lot of difficult language or has difficult to understand lyrics. Try to pick mainstream music. There’s nothing wrong with niche artists, but if you are looking to use music to connect with native English speakers, then it’s best to pick songs that the largest number of people are likely to recognize. Find songs where the lyrics are readily available, so you can look up what certain English words mean. If you possible, pick songs that have lyrics in both English and your native language. This is a great trick for easing yourself into listening to English Language music and can help you understand certain English words from context. This might sound odd, particularly if you don’t know what the lyrics mean yet, but singing along is a good way to learn the cadence and rhythms of English along with the sounds of the words you are singing. You can then look up the meaning of the words later, after they have gotten stuck in your head. If you are looking up music videos to listen to on streaming websites, such as YouTube, look for a closed caption option in your Langauge. Having both the lyrics in English and a real-time translation into your native language as part of the closed captions is an excellent way to improve your spoken English. The benefits of taking an ESL course are clear. By improving your English skills you gain better access to education, a better-earning potential, a better social life and even better results from healthcare. We here at Northwest Community College are committed to enhancing our student’s lives, which is why we are proud to offer our ESL courses free of charge to our students and to extend that offer to their families. Our seasoned language teachers are experienced in working with international students from all over the world and are there to help you get the most from your classes. To help your lessons fit in with your work and home life we also offer day and weekend classes. If you are interested in taking advantage of this excellent opportunity then call one of our ESL councilors today on (702) 403-1592.